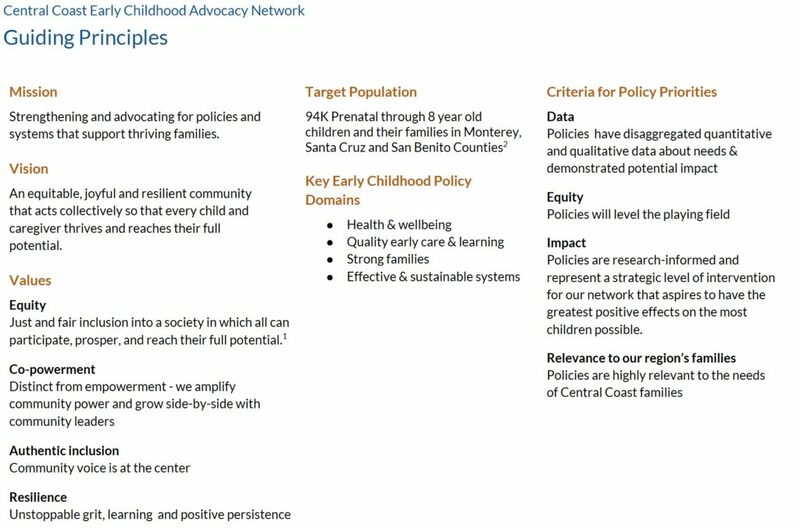 In conjunction with the work the Collaborative Action Teams are doing at the local level, Bright Beginnings is supporting a Policy and Advocacy Network to affect systems change through local and statewide advocacy. This includes building a county-wide commitment to support high-quality early-learning environments that benefit every family along with identifying and recommending actions to influence policy and systems change at both the local and larger levels of government. Identify and sustain effective systems and support systems change across the entire policy spectrum: local, state and federal. Promote meaningful public awareness and education about the importance of the Bright Beginnings indicators and early childhood development generally within and across communities. Empower individuals and communities to take action by supporting civic engagement and capacity building that is representative of all communities, in particular for parents and caregivers who are most affected by the policies and systems. You can access the Phase I report by clicking here.